This informative packet will direct you in the services and care. Fill out the New Patient Questionnaire for our staff to properly provide for your care. Also complete the second section of pertinent information regarding your vital contact details. The final page is the Patient Agreement. 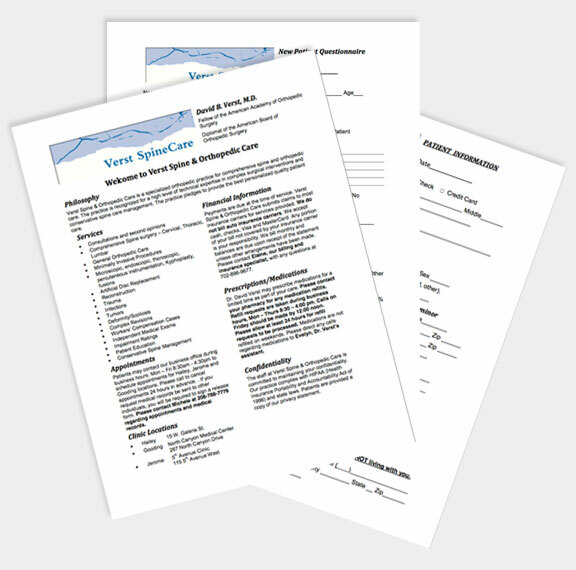 Please fill out and sign, returning the physical copy of this form to Verst Spine Care staff. These forms can also be faxed or mailed via the information on our Contact Page. We are required by law to maintain the privacy of your health information and to give you notice of our legal duties and privacy practices with respect to your protected health information. This Notice summarizes our duties and your rights concerning your protected health information. Our duties and your rights are set forth more fully in 45 C.F.R. part 164. We are required to abide by the terms of our Notice that is currently in effect. Your medical records are private and only you or other authorized people or agencies are allowed to see them. You have the right to see and obtain copies of your medical records. To obtain your records, you will need to give us a request in writing. It may take a few days for us to make your medical records available. If you have any questions regarding your medical records, please Contact Michele at 208-788-7779.